This event is returning after ten years! Come eñjoy the fun April 13 and 14,2019! 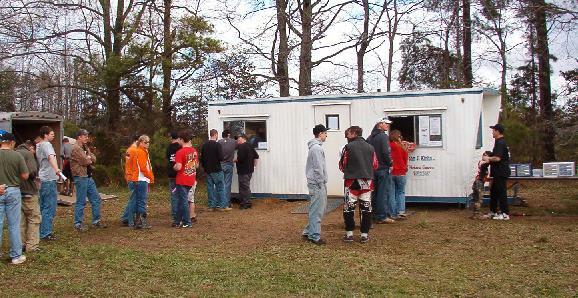 The Northern Neck ATV Park on Leedstown Road was the site for Round 1 of the VXCS 2009 season for dirtbike and ATV cross-country racing. This is the first time this six year-old series has held a race in the Colonial Beach area. Riders from as far away as Texas and Florida showed up to compete in the races, which are mainly frequented by riders from Virginia and the surrounding states. I'm lucky enough to live just over 4 miles away from the track, so this was one of those rare occasions where I did not camp out. Renee, Dana, Ashley, and Lori were working the rider sign-up operation. They were able to put me to work making sure everyone who wanted to sign up to race had their AMA (American Motorcycle Association) cards. Here's a pic of the lines at the rider sign-up trailer. Up first were the kids for their dirtbike ATV race. They sure looked like they were having fun out there, and fun is what it's all about. Kids on tiny ATV's and dirtbikes navigated their way through the woods with an incredible amount of skill. It's amazing what these little ones can do. The weather for the main events ended up being blustery and warm with a mix of sun and clouds. Much nicer than previous weather reports which called for possible severe thundershowers. 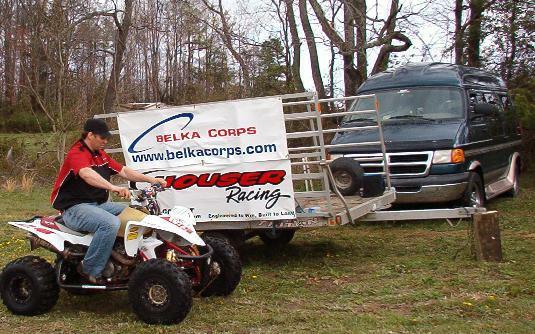 The track was roughly 7.5 miles long and included open fields, hills, woods, motocross and enduro sections. When the dirtbikes lined up for the start of their competition, race organizers took a quick poll to see if the riders would rather do 4 laps or 5. The majority of riders signaled that they'd like to go five times around, and so they did. That's something they probably later regretted. The start of the ATV race was delayed by 30 minutes due to having to re-route the track which proved too muddy to navigate after the dirtbikes had passed through during their race, as well as working to free riders that were still stuck in the mud. A few ATV riders became stuck as well. It kinda goes with the territory when you're cross-country racing. So does dust. It got really dusty out there on parts of the track. It was interesting trying to film the race in those conditions. Perhaps VXCS will add Colonial Beach to their 2010 racing season schedule!